<UPDATED SEPTEMBER 26, 2018 SPAGHETTI SUPPER AND LONG BEACH BAKE-OFF | LONG BEACH, CALIF.
Bake-Off Prizes: Each category winner will receive a blue ribbon and $50 for their favorite school, place of worship or charity. Runners-up in each category will also receive ribbons. Not to mention, you get bragging rights for a year! MARK TWAIN once wrote: "Twenty years from now you will be more disappointed by the things you didn't do than by the ones you did. So, throw off the bowlines. Sail away from the safe harbor. Catch the trade winds in your sails. Explore. Dream. Discover." MY MOTTO IS "EXPLORE. DREAM. DISCOVER." I WANT TO Explore, Dream and Discover as much as possible in my life here on earth, and I want my Web sites to empower, equip and incite others to do the same. I WANT TO help folks to find something new and exciting to do and experience. That's why I formed my charitable organization and named it the "Community Action Team"— a name that I feel encompasses all the varied activities and events that I have (and will continue to) organized for the good of our community. WHAT CAN I DO to help you explore your potential, make a dream come true or discover new frontiers? I hope to hear from you. THE MAIN PURPOSE of Justin's Community Action Team (CAT) is to promote social well-being among the general public. As a 501c3 nonprofit corporation governed by a board of directors, contributions to CAT are tax deductible and are used to help produce quality events within our community that benefit children, animals, and the environment. I AM A FIRM believer in the collective power of individuals joined in a spirit of goodwill and generous giving to bring about the success of a community. RESERVATIONS: CLICK: FREE spaghetti supper tickets here. TWO SEATINGS: 5 p.m. and 6 p.m. LOCATION: Bay Shore Church, 5100 E. The Toledo, in Belmont Shore. MENU: Spaghetti, optional meatballs, salad, garlic bread, soda/water, and desserts from the Long Beach Bake-Off. Plus, Vibes Cafe, coming to 62nd Place on the Peninsula in October, will be serving up coffee drinks during the supper/bake-off! SPONSORS: The Temple Family, Justin Rudd's Community Action Team (CAT), Bay Shore Chuch, Sound House Church, and Anthem Church. Please consider bringing any of these items for the AIDS Food Store: cans of tuna, jars of peanut butter, mac n cheese, oatmeal and breakfast cereals. BAKE FOR CHARITY'S SAKE! Each of the five category winner's charity or school will receive a $50 check! Free to enter the bake-off. Stay for the free spaghetti supper. 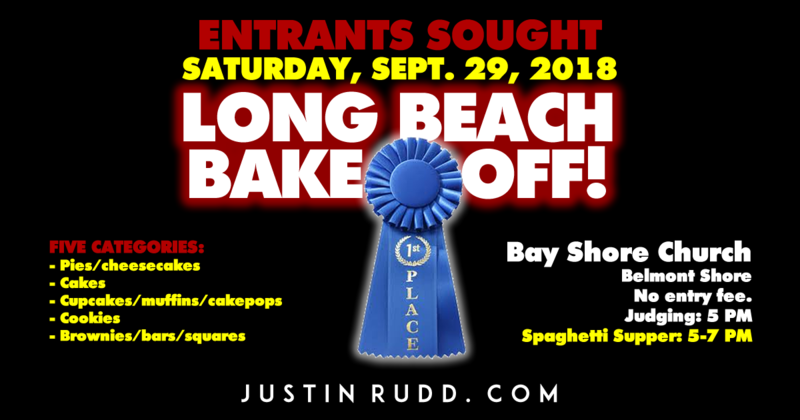 MORE THAN THREE DOZEN bakers are expected to bring goodies to the 8th-annual Long Beach Bake-Off hosted by Justin Rudd and his nonprofit Community Action Team. FREE ENTRY! Each category winner will receive a blue ribbon and $50 for their favorite school, place of worship or charity. Runners-up in each category will also receive ribbons. Not to mention, you get bragging rights for a year! 4Any leftover cookies, cakes, pies, etc. will be delivered to local homeless agencies. Justin Rudd’s nonprofit 501c3 Community Action Team (C.A.T.). • Deliver baked goods to the church's fellowship hall: 3-5 p.m. This year, during the judging and public tasting reception, each entry will be accompanied by the entry form that will include the contestants name, city, entry name, and some of the ingredients (the full ingredient list and recipe is not necessary). • Deliver baked goods: 3-5:15 p.m.
• Free Spaghetti Supper: 5-7 p.m.
• Awards announced: 5:30ish p.m.
FIRST PLACE winners' favorite local charity/school/place of worship will receive a $50 donation from the Community Action Team. Winner will also get a blue ribbon, and bragging rights for a year! The contest will be held in the fellowship hall at Bay Shore Church, 5100 E. The Toledo in Belmont Shore. THE TASTING RECEPTION after the judging is free for bakers in the contest and free for Long Beach Losers, and $5 for all others, payable in cash at the door. Deliver your entries from 3-5:15 p.m. Tasting reception and awards at 5:30ish p.m.
We also encourage carpooling, public transit, biking and walking. 4 Be sure to bring a signed entry form for each baked good you are entering. Each baker will be given a wristband for complimentary entry to the tasting reception. RECIPES MAY REMAIN ANONYMOUS. Entry forms will accompany each dish during the judging and during the tasting reception. For example, the entry form will have a place for the bakers' namd and city, name of the baked-good, and a few ingredients (not full recipes). • Pumpkin, rolled oats and dried cranberries. All baked goods in the contest must be made at home (not store bought). No boxed mixes (i.e. brownies, cakes, cookies made by adding oil/butter/egg to a mix). You can use a box of pudding to add to a cake recipe, for example. You may (and are encouraged to) enter more than one recipe. Bring one plate or platter of at least 24 cookies, bars, brownies, cupcakes, etc. with enough to feed three judges and 24 guests at the tasting reception. Cakes must remain whole. Entrants must bring their own serving utensil and cutting knife for their cake. A separate entry form must accompany each baked good. Recipes do not have to be original, but give credit if you are using someone else's recipe. This contest is for individuals, not teams (partners cannot enter together). The contest is open to anyone in Southern California. Decisions of the judges are final in all matters relating to this Contest. Each entry must use baking as the primary method of preparation. Entrants will agree to release the Justin Rudd, the Community Action Team (C.A.T. ), the judges, and all who participate in the production of this event from any liability without limitations. Baked goods must be entered in the name of the person who made it. It is possible to win more than one ribbon in each category if you enter more than one baked good in each category. Bring completely decorated cakes and cupcakes. No on-site decorating. Deliver each entry to the fellowship hall of Bay Shore Church, on ONE plate/platter/dish. Be sure to put a piece of tape on the bottom of your serving plate/platter/dish and write your name/email/phone/division/category on the tape/index card, so we can make sure each dish is returned to the right person after the reception. We will not be responsible for lost, broken, and/or eaten items. Contestants agree to be quoted and/or photographed and to use of their names, photographs without compensation. Email addresses will be added to our bake-off database. You do not have to be present to win. NO REFUNDS OR TRANSFERS. If you can not attend the awards/reception, please bring your baked goods on disposable plates/platters. We will not be able to return plates to you after this night. We are not able to mail any awards/prizes/checks for those who can not attend the awards/reception, but we can arrange a date/time for you to pick them up in Belmont Shore. We will not be responsible for lost, broken, and/or eaten items. Youngsters may enter, but they must prepare, bake and present by himself/herself. Pies: Erica Abke, Long Beach, pumpkin cream pie. It was her mom's recipe. Her charity is Yes We Serve. Cookies: Kristen Boscia, Seal Beach, chocolate chiptacular cookies. Her charity: Seal Beach Animal Care Center. On her entry form she wrote: "When I was 12 years old, I wanted to bake something sweet for holiday gifts and it was a hit with my family. The tradition continues and I now give them as birthday gifts and just to make someone's day." Second in "cookies" was Charlotte Long for her "pumpkin pillows with maple cream cheese glaze." It's a recipe handed down from her mom. Third in "cookies" was Isabella Morales for her chocolate macarons with salted caramel. Brownies/bars: Hannah Pham, Fountain Valley, pumpkin egg tarts. Her charity is The Ability Experience. Second in "brownies/bars" was also Hannah Pham for her "Matcha Red Bean Swiss Roll." Third in "brownies/bars" was Lily Dang for her "graveyard brownies." Judges were Marleen Hurtado, Teresa Hurtado, and Isis Vasquez. "Justin Rudd makes the Energizer Bunny look about as speedy as a fire hydrant." "Meet Mr. Tireless. Sometimes we think that if Justin Rudd never moved to Belmont Shore, the place would be overrun with feral cats and you'd be able to walk from Ocean Boulevard to the sea at Granada on a luxurious blanket of Styrofoam and cigarette butts. Instead, thanks to his work and the word "tireless' didn't exist until Rudd began walking and talking with dogs and clean-ups and education and miscellaneous pageantry, the Shore is a better place to live."